Marvel has released the full list of comics and collections coming out in May 2011, including the following Deadpool comics. Click on any item for more details. A spellbinding story of five heroes pushed to their limits! It’s 17th-century Japan, a time and place of violent upheaval, wandering Ronin, and mysterious Geisha. Into this strange and dangerous world come Wolverine, Pyslocke, Punisher, Hulk and Deadpool. Five of Marvel’s greatest heroes — as you’ve never seen them before. Each has been wronged by a powerful tyrant. Each has taken a solemn vow — of vengeance! Collecting 5 RONIN #1-5. Everyone’s favorite Merc with a Mouth continues hacking and wisecracking his way across the Marvel Universe in this latest volume of riotous, ridiculous and outright reprehensible team-ups! In Round 1, it’s clobberin’ time as Deapoolmania runs wild on the Thing! In Round 2, Indiana Deadpool runs afoul of Thor amid Asgard’s ruins and learns some treasures are best left undisturbed — particularly the ones containing evil, enormously powerful spirits imprisoned by Odin thousands of years hence. 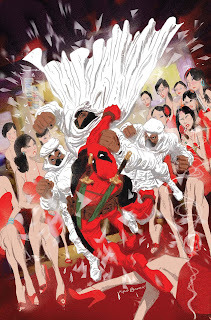 In Round 3, Deadpool and Iron Fist grudgingly team up to stop an ancient and villainous warlord — but Deadpool have to take down Iron Fist, as well, to secure his payday? In Round 4, gaze in horror upon the fiendish experiments inflicted upon Deadpool and Bessie the Vampire Cow by the malevolent Dr. Kilgore in the name of mad science, and bear witness to their terrible revenge! In Round 5, the voices in Deadpool’s head hire him to do the dirtiest job of his career, but the mission is endangered when he’s trapped in an elevator with the Watcher! In Round 6, Deadpool realizes there’s no government bailout for super-powered mercenaries and is forced to do the unthinkable: look for a job! Luckily, Galactus has a position open in the Herald department. And for the knockout punch: Wolverine, Deadpool and a giant robot! Collecting DEADPOOL TEAM-UP #888-883 and WOLVERINE/DEADPOOL: THE DECOY (MDCU). When the government has a problem that’s too dangerous to handle, they call in the one man crazy enough to solve it: Deadpool. Unkillable mercenary, definite weapons expert and swordsman, hopeless romantic, nutjob. But when he’s targeting the likes of Hammerhead, leader of the most powerful criminal organization in the world, or Baron Helmut Emmerich Von Zemo, hood-wearing warrior of hate, even an unkillable super-agent may not be enough! You may think you know Deadpool, but you have no idea. Guest-starring Cable, the Taskmaster, and Domino! Collecting DEADPOOL MAX #1-6. On a distant planet, a simple native population revolts against the mighty Omega Confederation. Since the Omega Confederation is paying a lot of money to the galaxy’s top mercenaries — Hello, Deadpool Corps! — to put down this rebellion, it’s no wonder they’re a little miffed when Wade Wilson and company appear to have changed sides. So they send a crack squad of recon shock troops to remind Deadpool to do his job. 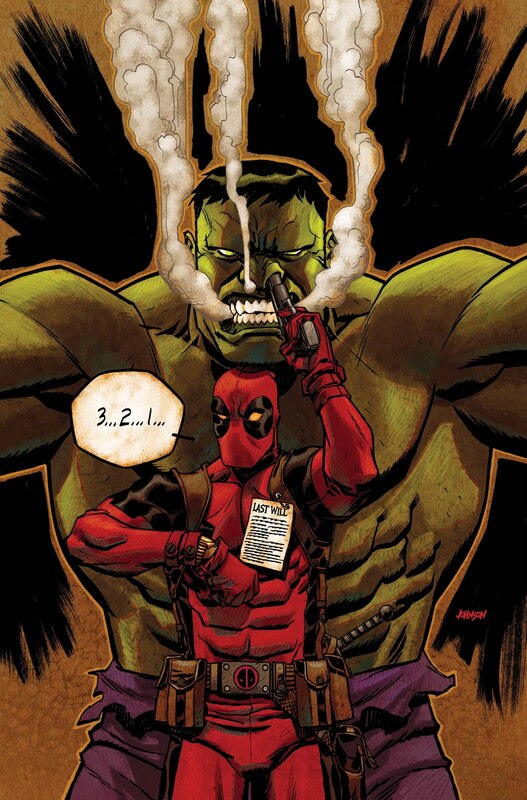 The thing is, not even Deadpool knows for sure who’s side he’s on. Tune in to watch him figure it out. Collecting DEADPOOL CORPS #7-12. Deadpool is living the lie! A brutal massacre in Mexico leaves hundreds dead, but becomes an international incident when one psychotic, mouthy mercenary walks away from the carnage. It’s Wade Wilson, and he’s got some ’splainin’ to do! Always a man of the people, Deadpool uses the opportunity to shed some light onto his true origin as a military grunt and patriot who volunteered for the human experimentation of the Weapon X project to become a super-soldier for his country. But wait — that doesn’t sound like the foulmouthed, wisecracking, hard-partying, misanthropic mercenary we all know an love. The truth is all a matter of perspective in this revealing look at the Deadpool’s history and his broken mind. Who really hides beneath the red-and-black mask, and what really happened in Mexico? Collecting DEADPOOL: WADE WILSON’S WAR #1-4.